Even if you are the proud owner of a GCSE in geography, you might not be entirely sure where the Dominican Republic is. Your instinct might suggest that it’s close to the Caribbean somewhere, but did you realise that it shared the island of La Hispaniola with Haiti? In fact, it’s just east of Cuba, west of Puerto Rico, south of the Bahamas, north east of Jamaica, very close to the Tropic of Cancer, and is sandwiched between the Atlantic to the north and the Caribbean to the south. Including a stopover in Paris, the Air France flight from Heathrow takes about 12 hours, but as soon as you step out of the aircraft into the balmy tropical air, you sense that the effort has been worth it. Golf in the Dominican Republic is having its time in the sun right now. It’s currently one of the hottest places in the world to go golfing and its reputation is growing by the year. Admittedly, it’s suffered in the past with tales of food poisoning woes and packages holiday nightmares, but just look at the quality of the courses and the high end resorts moving in, and it’s obvious things are changing. With ocean vistas a plenty, and courses which hug the shoreline, the Dominican Republic is arguably the best golf destination in the Caribbean. Visiting golfers to the nation increased by 40 percent last year, with those numbers set to keep on rising. Pete Dye’s iconic Teeth of the Dog course at the luxurious Casa de Campo resort celebrated its 40th anniversary in 2011, and should be on everyone’s bucket list. 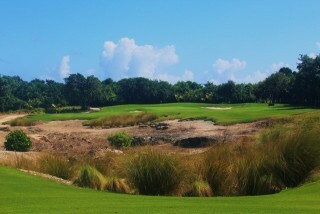 It features three spectacular par threes and is oceanside golf at its finest. It’s the Dominican Republic’s signature layout, but Tom Fazio, Jack Nicklaus, Nick Price and plenty of others, have built upon that wonderful foundation. Here are five more of the best courses to tackle and an update on a new luxury arrival. This immaculate Fazio design opened in 2010 as an exclusive playground with limited public tee times. The Corales course takes an Augusta National approach to its conditioning, with no blade of grass out of place. The three ocean holes starting at No.16 are called ‘El Codo Del Diablo’ (‘The Devil’s Elbow’). The two coastal stunners that finish the front nine, the par-4 eighth hole and par-3 ninth, might be even better. Crooner Julio Iglesias and dress designer Oscar de la Renta – two investors at Puntacana – own secluded homes on the course, as does Russian ballet dancer Mikhail Baryshnikov. 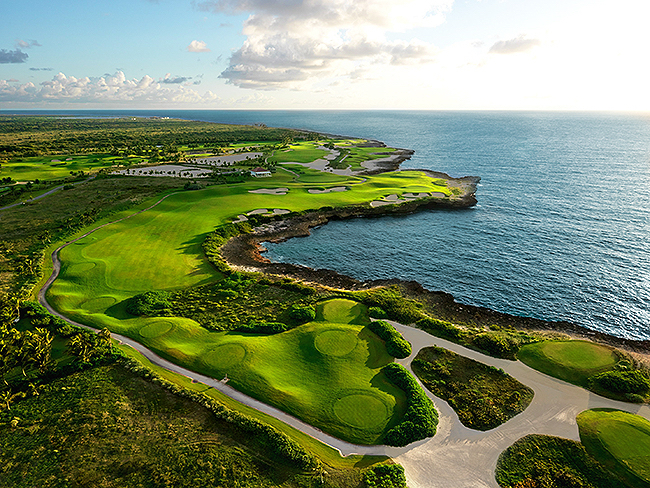 Jack Nicklaus introduced Punta Espada to the troubled Cap Cana development in 2006 by making a birdie on the incredible par-three 13th hole over the ocean. Several of the tees and greens of the eight picturesque seaside holes are so close to the rocky coast that golfers can actually feel the ocean spray on their faces while playing. Even the so-called inland holes are not short of drama or appeal. At a gimme shy of 7,400 yards off the back tees, it’s certainly not short, and even the great players of the Champions Tour, which hosted a tournament here for several years, learned to respect it. In 2011 Pete Dye added another nine holes to an amazing facility that dances on the cliff tops of a 300-foot-deep river gorge. 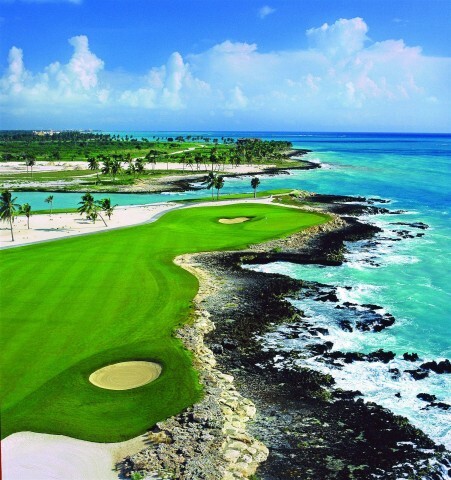 The 27 hole facility boasts spectacular views of the Caribbean Sea, the Dominican mountains (the highest in the Caribbean), the Chavon River and the Casa de Campo Marina. Dye Fore might play second fiddle to Teeth of the Dog, but it’s certainly not a second-tier experience. 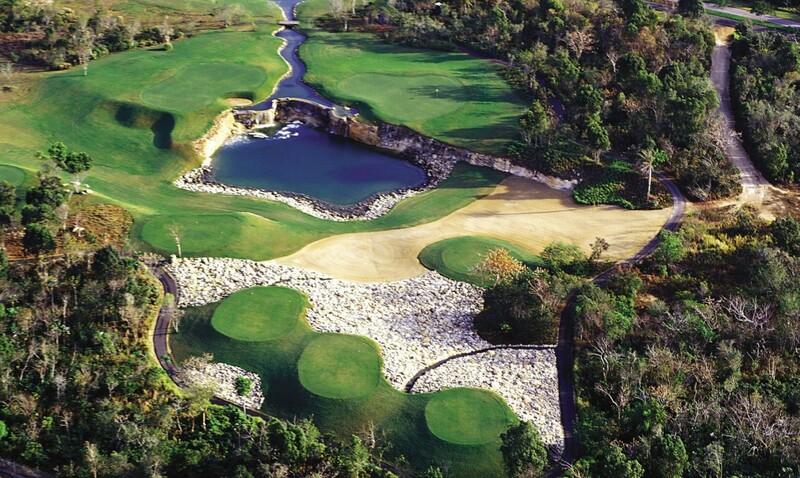 This 7,156-yard Gary Player design sits in the jungles of Juan Dolio, less than an hour from the airport of the capital Santo Domingo. Player designed two greens separated by a waterfall on the par-three 13th hole, a unique twist on an otherwise straightforward resort course just minutes from the Costa Caribe Corale Resort, Spa & Casino. irport. 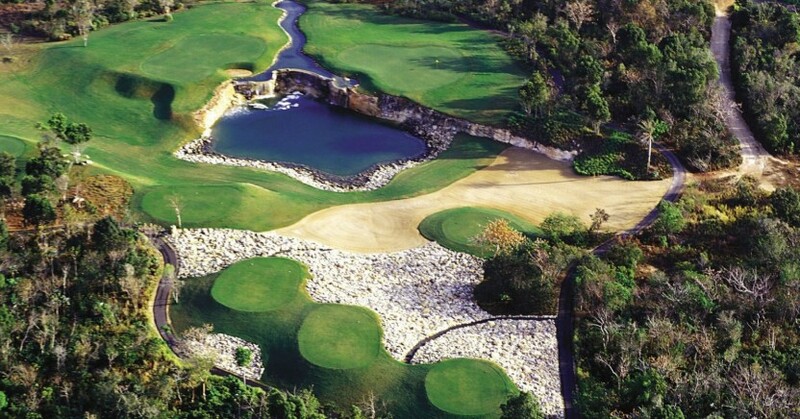 The fairways at Cana Bay Palace start out quite generously, but narrow as the round goes on. The 453-yard ninth is both the hardest and the prettiest hole with water at every turn. If further proof was needed that the Dominican Republic has hit luxury heights, you have it with the arrival of the ultra-elite Aman Group and its Amanera resort. Named after the Sanskrit word for peace – ‘aman’ – and ‘era’, the word for water in Taino, the language historically spoken by indigenous people of the Caribbean. Set on a cliff top, overlooking the crescent-shaped Playa Grande beach and framed by the dramatic Cordillera Septentrional mountain range, the resort is the hotel group’s first golf-integrated property. How to get there: Air France flies to Punta Cana three times a week from London. It also operates three flights a week to Santo Domingo, Las Americas. Both flights are from Heathrow and go via Paris. For more information visit www.airfrance.com. For golf packages visit www.yourgolftravel.com.